Today, my to-do list keeps growing instead of shrinking. It’s like a monster from a sci-fi movie, a speck of a bug that everyone scoffs at until it morphs into a gigantic beast who crushes unsuspecting humans underfoot. I’m running around, working frantically at each item on my list. But I’m hopping from the laundry to picking up beads to cooking, back to laundry to writing to playing puzzles to more writing to cleaning up more beads and then reading my daughter a book. Unfortunately, as I wash and scrub, I’m discovering more cleaning to do along the way. Open up the refrigerator. Good grief—how long since I’ve cleaned in there? Open up the microwave. The inside looks like a modern art painting. Yeah, add “clean microwave” to the list. I’m working. I’m active. But I’m not getting anything officially done. I’m bouncing too much from project to project. There’s so much to do, it’s hard to pick a starting point. It’s difficult to shut my eyes to the rest of the mess and just scrub the spot I’m on. Isn’t that it always? There’s so much to take in. So much to do. So many activities and so little time. One thing. That’s really all we need sometimes. We’re trying to do it all, and God asks us just to do one thing at a time. 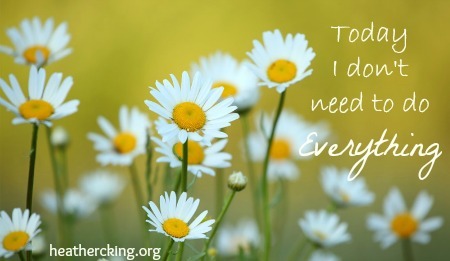 Who is the one person I need to encourage today? What is the one main thought or verse I need to take away from time in God’s Word? What’s the one issue I need to make top priority with my kids today? What’s the one conversation God wants me to have? What’s the one thing God wants me to learn today? What one lesson does God want to teach me in this circumstance? He can do more, of course. He’s God, so abundant the way He rains down blessings in those seasons. One thing I have desired of the LORD, That will I seek: That I may dwell in the house of the LORD All the days of my life, To behold the beauty of the LORD, And to inquire in His temple (Psalm 27:4). Jesus lifted that duster and the bottle of Pledge right out of Martha’s hands and told her, “One thing is needed, and Mary has chosen that good part, which will not be taken away from her” (Luke 10:42). Her sister, Mary, had found the one thing true and vital—time with Christ. When the rich young ruler sought salvation, he declared that he had followed every rule, every bit of the law and fulfilled all of its requirements. Jesus cut through all of the excess and said, “You still lack one thing. Sell all that you have and distribute to the poor, and you will have treasure in heaven; and come, follow Me” (Luke 18:22). There was one issue, one lesson, one attitude of the heart that Christ needed to address with this man. Unfortunately, even though the rich young ruler was willing to take on the cumbersome burden of the law, he wasn’t willing to do the one thing Jesus really wanted. Material goods mattered more than salvation to him. When Jesus healed a man who had been blind since birth, his family and friends pestered him with questions. How did this happen? Who healed you? Where is this Jesus guy now? Then the Pharisees heard about the healing and asked questions of their own. Who is this healer? Why does he have such power? How can a sinner perform this miracle? Tired of it all, the man finally said, “Whether He is a sinner or not I do not know. One thing I know: that though I was blind, now I see” (Luke 9:25). Sometimes we want to know everything. The reasons for the past. The destination of the future. How God is going to work it all out and certainly when it’ll all happen. What if instead of trying to know everything, we stick to the simplicity of truth? I know God is in control. Maybe that’s my one thing.